1. Transcreation Specialists Are Writers. Usually, people who provide transcreation services are copywriters in other languages instead of translators. Some translators also happen to offer copywriting services in other languages, but in general, these are two different services, and the people who provide the services are not always part of the same professional associations and networking groups. 2. Transcreation Starts with a Creative Brief. Unlike translation, which starts with a source text, transcreation starts with a creative brief, just like your other creative projects do in your source language. Instead of simply providing text to the transcreation provider, you’ll need to provide them with clearer ideas of the creative concept and the desired action you are hoping to trigger with the copy. 3. Transcreation Is Billed by the Hour. Translation is typically billed by the word, whereas transcreation is billed by the hour, or sometimes by the project. Just like other creative services, such as copywriting, graphic design, video production, transcreation is normally billed at hourly rates. 4. Transcreation Results in New Messaging. Usually, messaging that was written for one target segment or audience will not resonate with a completely different group. With transcreation, the result is brand new messaging that is targeted and localized, while with translation, the result is new words in another language, but with the same messaging. A good translator will translate website or app content “in the spirit” of the source text without being too literal, but even so, the message can lose impact in the process of straight translation. 5. Transcreation Is for Creative, Marketing-Focused Copy. Translation is perfectly fine for informative text, but when text is designed to trigger an action from the reader, as marketing text usually is, transcreation is simply a better fit. 6. Transcreation Involves Advising on Look and Feel as Well. Often, providers of transcreation services will also advise customers on the look and feel of a creative asset or campaign, to ensure acceptance and resonance in the local market. 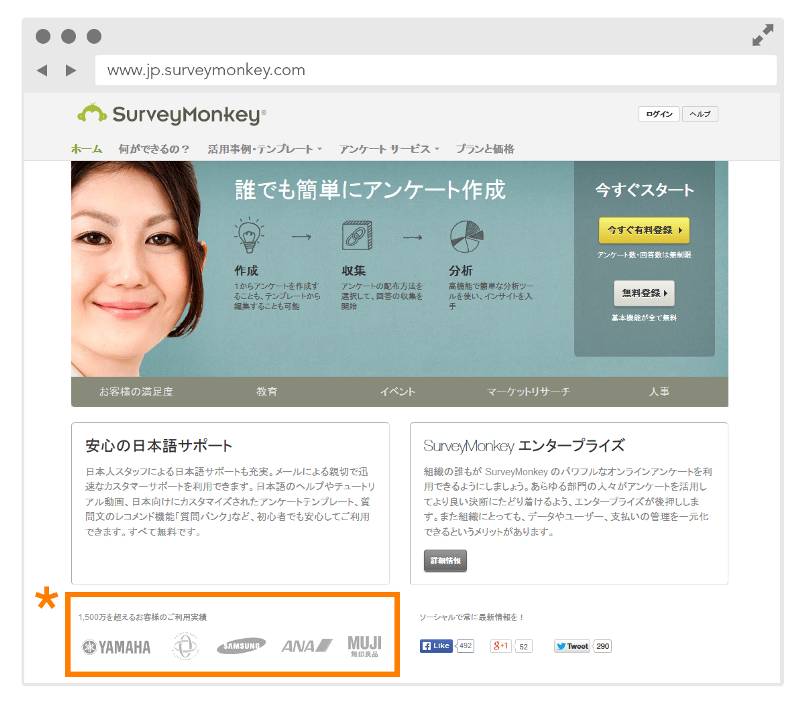 For example, take a look at this screenshot from SurveyMonkey, a Smartling customer. 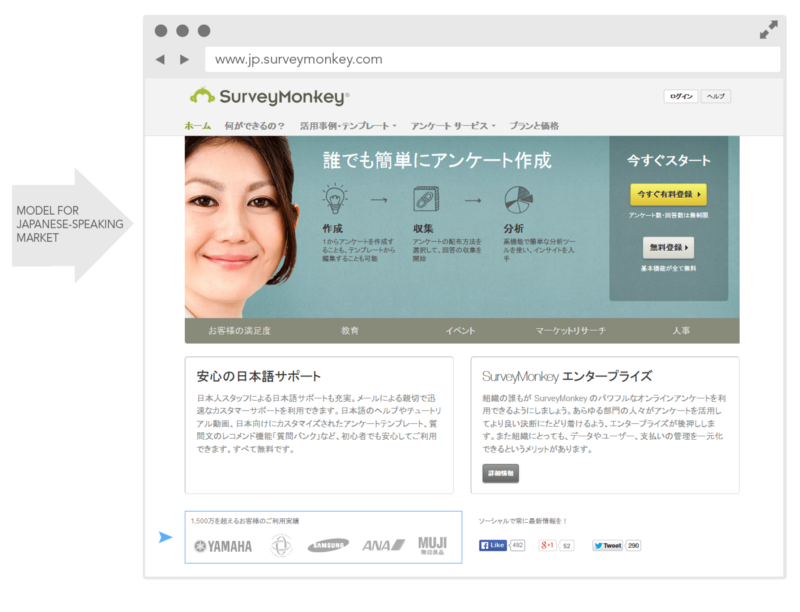 The home page in English features a model who is likely viewed as reflective of the majority of native English speakers. However, when you switch the language to Japanese, the image changes. 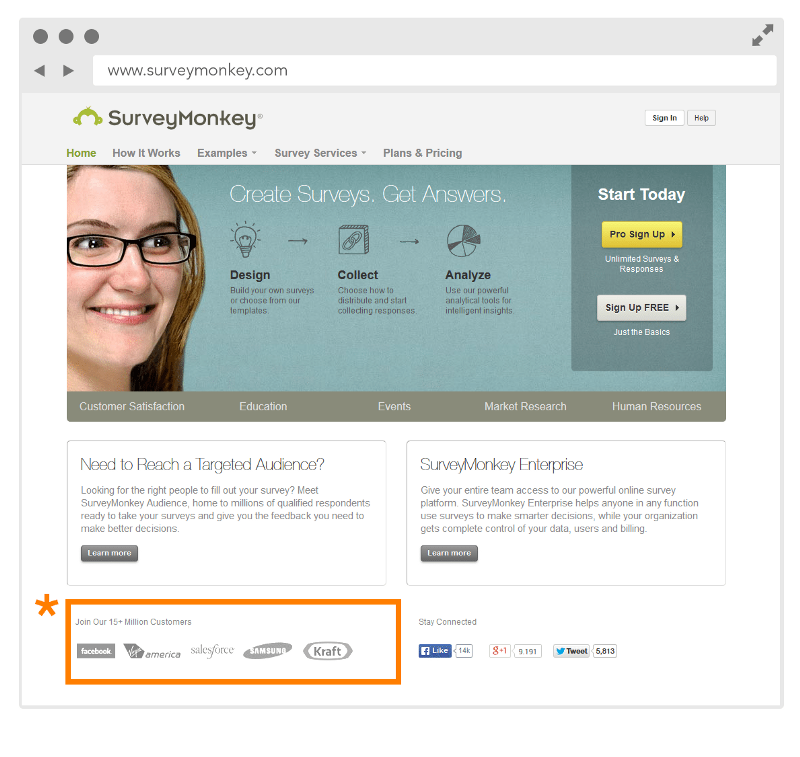 Likewise, the types of companies SurveyMonkey features in one market are not the same companies it features in the next. For Japan, companies like Yamaha, ANA (the national airline of Japan) and MUJI are instantly recognizable, while for English speakers, these brands would matter less. However, for speakers of American English, brands like Facebook, Virgin America, and Kraft are more likely to be familiar. 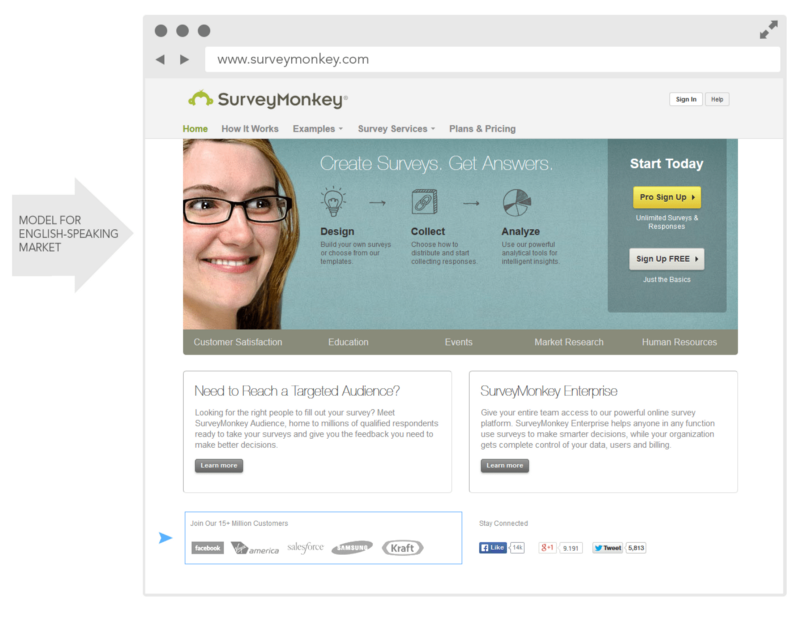 Find out more about how SurveyMonkey went global in this case study.